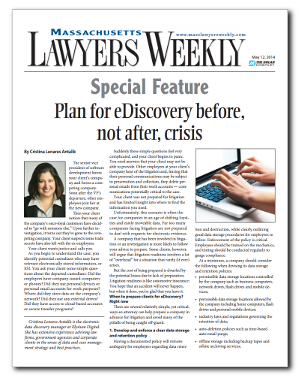 What should you, as a lawyer, do to help your clients prepare in advance for litigation involving electronic evidence? Elysium's Cristina Lenares Antalik provides critical, yet relatively simple, steps that lawyers can take to help their clients avoid some of the pitfalls of being caught off-guard. Antalik notes that "Reasonable forethought and planning can reduce risk, save substantial cost, and position you and your client for future success."